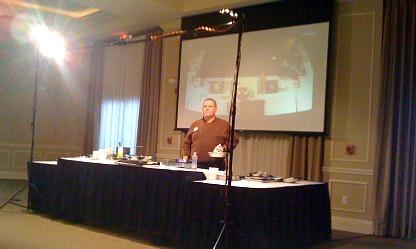 Craft and Cuisine - Cooking demos at The Resort at Marina Village Cape Coral, for great cooking tips and great food. UPDATE November 2012: The Resort at Marina Village will become a Westin Hotel in December. It appears the cooking demos are on hold as the resort changes hands. Happening once a month, you will get to experience the talents of Marina Village's accomplished chef. Chef Drew Tait believes that simple and flavorful cooking makes the best dishes. And when I saw what the menu was going to be, I couldn't resist! 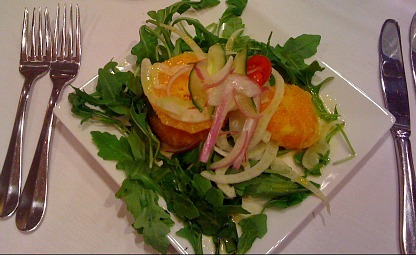 We started with an Orange Citrus Salad with Baby Arugula and I learned a better way to cut up a pineapple and slice oranges. The flavors blended beautifully with just the right amount of dressing. 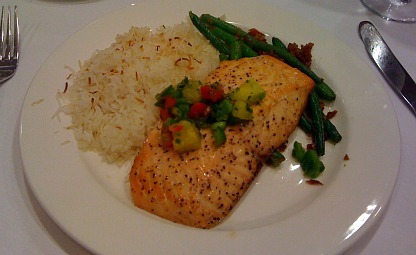 Our main course was Pan Seared Salmon ........ served with Coconut Rice and Bacon Green Beans. The salmon was perfectly cooked with a hint of seasoning and delicious with the side dishes. I love coconut and never thought to add it to rice, but I will now, for sure! And who doesn't love bacon? Sprinkled over green beans tossed with a vinaigrette makes them very tasty indeed. 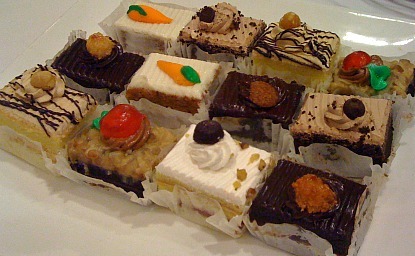 We ended with dessert, a choice of lovely cakes, I chose one of my favorites, the carrot cake. Chef is full of information to help you in the kitchen ....... some of the things he taught us were all about the different peppers, how to hold a chopping knife, make perfect rice, and the best way to toast coconut. For only $25 per person, you get the demonstration, a delicious lunch, and a packet with recipes. Craft and Cuisine is on the second Tuesday of the month, October - May, from 12-2PM, in the Rosen Ballroom, across from Marker 92. Registration for the cooking demo should be made no later than 24 hours in advance, and you should arrive at 11:30 the day of the demo to have plenty of time to check in.